Home > Building on Experience: National Drugs Strategy 2001 - 2008. Ireland. Department of Tourism, Sport and Recreation. 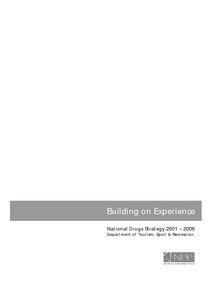 (2001) Building on Experience: National Drugs Strategy 2001 - 2008. Dublin: Stationery Office. The Department of Community, Rural and Gaeltacht Affairs has responsibility for co-ordinating the implementation of the National Drugs Strategy 2001 - 2008. The Strategy, which was launched in May 2001, was the result of a request by the Cabinet Committee on Social Inclusion for a review of the national drug strategy. This review was conducted in order to identify gaps and deficiencies in the drug strategy and to develop a revised and updated approach to the drugs issue in Ireland. Ireland's current approach to the drug problem has developed around four key headings or pillars: supply reduction, prevention, treatment and research. This approach has involved key agencies in the state, voluntary and community sector. The overall strategic objective for the National Drugs Strategy 2001 - 2008 is to significantly reduce the harm caused to individuals and society by the misuse of drugs through a concerted focus on supply reduction, prevention, treatment and research.